This is an online library of EOBD, OBD-II and VAG (VW Audi Group) automotive fault code definitions. We currently have more than 21,000 code definitions within our database, and it is still growing. Which makes do we cover? Our database currently includes both generic definitions and manufacturer-specific definitions. Generic definitions apply to all manufacturers, i.e. the same code will mean the same whether on a BMW or a Ford car. Manufacturer-specific definitions are unique to a particular manufacturer (and sometimes to a particular model). Can't find the diagnostic port? Paying subscribers can now also access our database of diagnostic port locations - complete with photos for many vehicles. 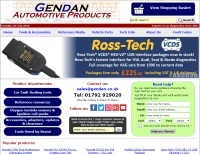 We are a UK-based car diagnostics specialist. Please visit our online diagnostic tools store by clicking here. You can sign up and use the service for FREE. The free account gives you a limited number of searches per week. If you find you need to use the service more often, you can upgrade your account.